High-end Victoria Beckham and Rihanna wigs in blonde and auburn blends. They are absolutely beautiful. Only 3 (1 - blonde blend, 1 -auburn blend, 1 - brown blend) in stock. Below is a sampling of synthetic lacefront styles available. Depending on the style, colors available 1, 1b, 2, 4, and 6. Wig Special $25.99 - while supplies last. 1, 1B, 2, 4, 280, 34, 44, 51, 1b/27, 1b/30, 1b/33, 1b/BUR, 1B/350, 1b/250, 1B/60 (color shown), 1b/2079, 1b/2033. 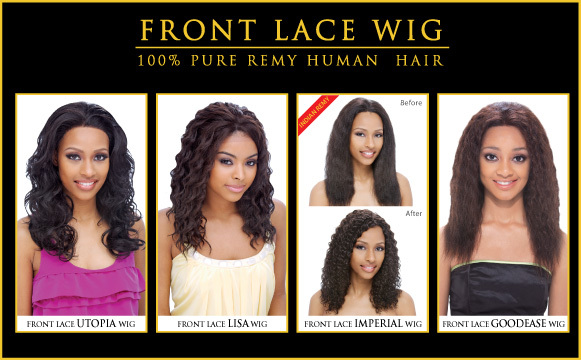 You will be able to find synthetic and human hair wigs to fit every budget in our Lacefront Illusions Wig Boutique some for as low as $5.00! Also, we offer discounts to licensed hair stylists.